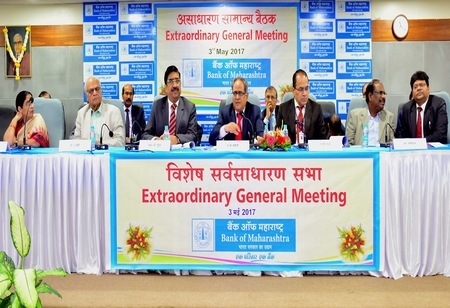 The Extra Ordinary General Meeting of the shareholders of Bank of Maharashtra held today at Lokmangal, Pune, approved the capital infusion of Rs 300 crore by the Government of India on a preferential basis. Accordingly, the bank can now augment its equity capital by issuing 8,88,88,888 equity shares of Rs 10 each at premium of Rs 23.75. This will enhance the CET 1 ratio of Capital adequacy by approximately 30 basis points and take the Government holding in the Bank up from 81.61% to 82.91%.